You’ll be left happy with your sweet tooth more than satisfied after this trip into a land of candy, chocolate and other sugary treats and payouts. Make your childhood dreams come true with a visit to the candy factory in this 5 reel, 9 payout video slot with lots of playful features. With a betting range beginning with an offer of coin sizes from $.05 to $2.00, you can wager a maximum of 5 coins to a top risk of 45 per spin. Players can spin to achieve the top base jackpot of 8,000 coins. The intro movie mimics a child’s vision of sugarplums so to speak and includes an introduction to the main characters, Dr. Chocolate, Mikey Boy and Candy Girl before it opens to the reels. With bright, cartoonish graphics framed by the vividly marked gears and tubes that comprise the candy machine, Chocolate Factory offers reel symbols to appeal to every taste including delicious treats like the hazelnut, chocolate coin, a praline shell, the chocolate mint, maraschino cherry, a Turkish delight and add the excited Mikey and Candy in hopeful anticipation of their big reward. The reels spin to the sound of the whir and pings, bells and whistles mark wins, scatters, wilds and bonuses. Squeals of delight from the children are interjected on bonus wins. 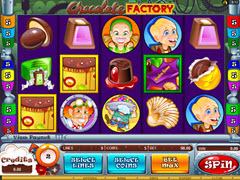 Dr. Chocolate is the wild symbol and can replace any of the candy symbols on the reels with the exception of the scatter or the bonus symbols to complete a winning payline and will add a multiplier up to 8,000x should 5 appear on the reels. The Confectioner is the scatter symbol and will add a multiplier to your wins when 2, 3, 4 or 5 appear at the value of 2x, 10x, 25x and 200x respectively. The purple bonbon is a bonus symbol where 3 or more will activate the Bonbon Box bonus game. Here you can select from a box of 10 confections to uncover bonus credits up to 4,375 under each until you reveal the collect message that will end the round. The golden chocolate vat serves as the second bonus symbol triggering the Dunk-a-treat bonus game with the appearance of 3 or more on the reels. 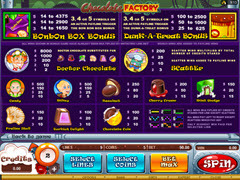 In this game, you will be offered a selection of 5 different items and you may select one to dunk into the chocolate to win up to 2,500 credits. With plenty of ways to collect big payouts, lively visual and audio graphics and fun features to add diversion, this game will be a winner for those looking to move away from more scaled down slots without launching directly into the more complex varieties. It hits a middle range for both style, betting range and payouts making it suitable for any level of player and worth the tasty treat.